Barber Foods® creator of the Original Frozen Stuffed Chicken Breast, is celebrating its 60th Anniversary, and now the best is even better. They’ve created a new look and new recipe for a one-of-a-kind eating experience. 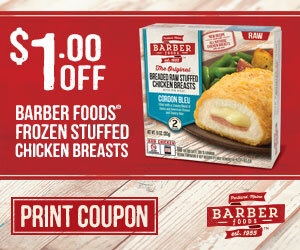 Barber Foods® is a leader when it comes to the stuffed chicken breast and is proud of its high-quality products. With a home-style breading and more of “the good stuff,” the new product is something to celebrate. Save on Barber Foods® today and check out their new look and new recipe includes home-style breading and more of the good stuff. Print this $1 Off coupon to redeem at your local grocery store. Having Barber Foods® Frozen Stuffed Chicken Breast on hand is like having a home-cooked meal waiting for you in the freezer. It’s an excuse to gather the kids, spouse or whole family around the table to have a unique, one-of-a-kind dinner experience that’s simply special. The easy prep leaves more time for everyone to enjoy the meal.